While records, according to a common adage, are meant to be broken, some sure do linger longer than others. One such NBA standard of excellence – an accomplishment that stands unmatched as you read this – was cemented into place exactly 46 years ago today. In front of a sellout crowd and national TV audience, on Sunday January 9, 1972, “The Logo” and Company tasted defeat for the first time in 34 games. The Los Angeles Lakers’ longest-ever winning streak was snapped – it just happened to require a home-standing defending champion that featured not one but two of the Association’s most iconic players. 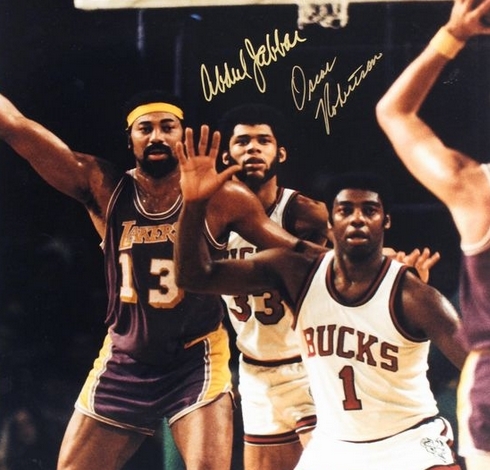 Quite the match-up, Wilt & West vs. Kareem & The Big O – probable Conference Final, "Fantastic"! Celtic great Bill Sharman’s squad had not lost since Halloween, and was winning convincingly. Their closest challenge was a four-pointer against Baltimore, Game No. 1 of the streak. Connie Hawkins and Phoenix also extended them to OT before falling by nine. And Coach should have called himself “Sherman” the way his troops had stormed (134-90) through Atlanta two night’s prior. LA’s margin of victory during the streak was 16 points per game. However, Milwaukee mentor Larry Costello – Chamberlain’s former 76er teammate – had his young champions motivated for their moment. I’m glad Atlanta didn’t beat them Friday night so we could have the chance. The Lakers started off in sync, building a seven-point early lead – but then went over six second-quarter minutes without registering a single field goal and went to halftime six points in arrears. Calamity struck a minute and a half into the second half when Wilt was whistled for his fourth personal foul – it shows in the rebounding numbers. Now you don’t string together that sort of success without establishing some genuine confidence, and the Lakers pulled themselves within two points with seven minutes left in the game. But the Bucks responded with an 18-2 blitz that put the game away, and the Lakers’ historic streak firmly in the record book. Coach Tom Heinsohn’s developing champions were closing out a less-than-mediocre (2-4) West Coast swing with a loss to Spencer Haywood and the Seattle SuperSonics. For the second consecutive weekend, Boston had been scheduled to play Friday, Saturday and Sunday – in a different city each time. The grueling stretch had begun with a New Year’s Eve victory over Philly at the Garden, the team’s tenth in a row. These young Celtics would return to the playoffs for the first time since Bill Russell’s retirement, posting eight more regular-season victories than Big Bill’s final ring-winners in so doing. Basketball players can be strange, you know. When the shots go in, you play with more zest. When they don’t, sometimes you can lose a little determination.